Please find below answers to sellers' frequently asked questions. Do not hesitate to get in touch with us should you have any other questions or feedback using the general enquiries and feedback contact form. How do you attract customers to view my listings? What tips can you offer for setting up my Stall? How do I display payment options for my items? Can I sell vintage inspired items e.g. clothing or handmade? What are the item listing or sale fees? I would like to start with a 30 day selling period and later change to a 365 day selling period, is that possible? Do I have to provide Seller Policies when I first register? How do I set an item's delivery option? What are optional supporting promotions and when can I choose to run them? Are there any limits on the number of items I can sell? Are there any restrictions on selling Internationally? Can new vintage categories be added? Is it possible to temporatily hide listings e.g. 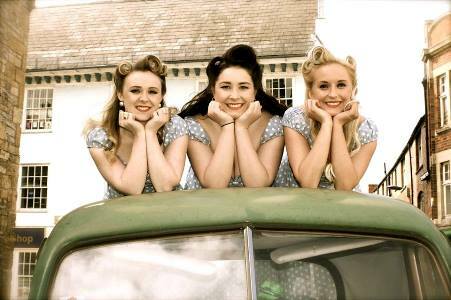 when selling at a vintage fair? Why list online when some customers will wish to see or try on my items? How do customer review ratings work? What does the "Something wrong with this listing..." link mean at the bottom of every item listings page? How do I manage my seller's account? Listing items - my images are missing &/ or need to change my main image? Vintassion extensively features your listings through its weekly UNCOVERED Newsletter and social media Facebook, Twitter, Pinterest, and Instagram; where we have a growing 10,000+ genuine followers combined! Please contact us if you see any opportunities we could be doing to further attract customers to your listings. Sellers can offer a range of payment options including a buy now "PayPal Click Here To Buy" button, which enables Customers to click and pay the Seller of an item securely via PayPal using their credit or debit card, bank account or direct from their PayPal account if they have one. For further details on how buy now works please click here. Where a Seller does not offer a buy now payment option for an item or Customers wish to purchase more than one item from the Seller, they may send the Seller a buy enquiry message, by clicking the "Contact" button on the item listing, and confirm the item(s) availability, price, delivery options, and payment options, e.g. at an Upcoming Fair or to check out through the seller's own online shop/ website if they have one. Customers usually wish to be sent a PayPal payment request/ invoice as this gives the buyer protection offered by PayPal and they can easily pay via PayPal using either their credit or debit card, bank account, or PayPal account if they have one. Sellers also get the seller protection offered by PayPal. You can have up to 100 different items listed for sale at any one time, plus unlimited reserve stock (inactive listings) i.e. items under your Stall so to speak ready to place on your Stall with the click of a button, so as you sell you can quickly re-stock sold items to keep listing up to 100 items for sale. highlighting of any 5 of your listed items to feature on the Vintassion homepage item preview slider and in search results. When you sell an item make sure you request a customer review after delivery by logging in to your seller’s dashboard and clicking on the “Request Review” button from your Manage Listings sold items table. Having more good reviews will help attract more sales. 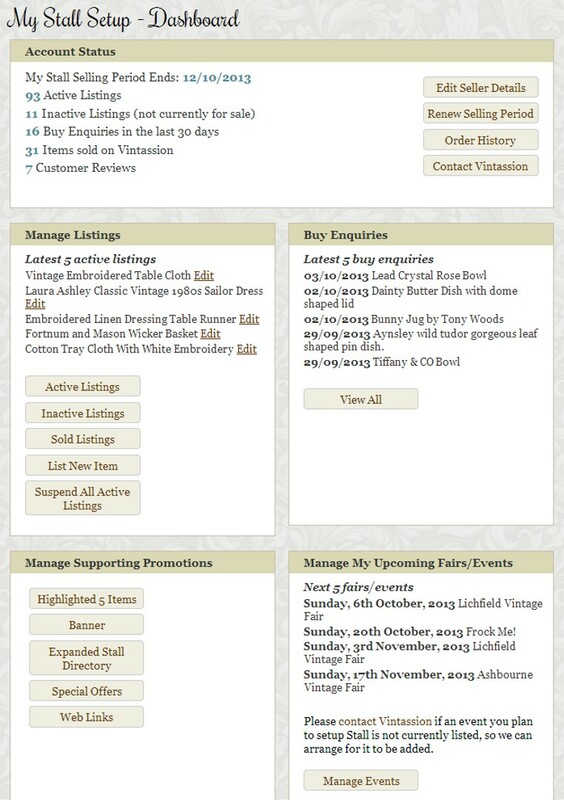 If you also enjoy selling at Vintage Fairs and Events you may also let online visitors know about any you’re planning to make, just login to your seller’s dashboard and go to the Manage My Upcoming Fairs/ Events. So when vintage shoppers like the look of your Vintassion Stall web page and would like to see more or take a closer look, they have an opportunity to visit your Stall at an Upcoming Vintage Fair or Event - www.vintassion.com/upcoming_vintage_events. When you first register a Seller's account you can select any of the following Standard Payment Options for display at the top of your Stall web page and on all of your listed items: Internet Payment, PayPal, Credit Card, Cheque, Cash on Collection, and Please contact seller to confirm payment method. You may change your Standard Payment Options at anytime by logging in to your Seller's Dashboard and using the "Edit Seller Details". Please note your selected Standard Payment Options will be applied to all of your listed items i.e. it is not possible to set different payment options for a particular item. In addition, to the Standard Payment Options you are offered the option when you first register use a buy now "PayPal Click Here To Buy" Payment Option. You may then use the "PayPal Click Here To Buy" button for one of more of your listed items, so Customers may buy and pay direct in to your registered PayPal account. Please be assured Vintassion does not charge Sellers any listing or final sales fees for the items purchased. Seller's may easily de-activate and re-activate the buy now option at any time by logging in to their Seller’s Dashboard and using the “Edit Seller Details” button. For further details on how buy now works please click here. Absolutely, we are always pleased to welcome sellers of vintage inspired items, as they very much fall within the vintage and retro theme of the Vintassion Online Vintage Fair. Good News there are no individual item listing or final sale/ commission fees. To list and sell items on Vintassion the only cost you need pay is an affordable simple fixed fee of £10 for a 30 day selling period or £50 for 365 day selling period. Yes, if you wish you can seamlessly follow a 30 day selling period with a 365 day selling period or vice or versa. When sellers register with Vintassion they can enter their own Seller Policies or leave the default words “Please contact seller to confirm their Seller Policies (Terms & Conditions) including their Terms of Sale, Returns Policy and Delivery Policy.” Once registered sellers can easily add or update their Seller Policies at any time. It is important to note that any transaction between a Seller and a Customer is done using solely the Seller Policies (Terms & Conditions) including Terms of Sale, Returns Policy and Delivery Policy. It is the Seller’s responsibility to provide Policies that are fit for purpose. To add your Seller Policies login to your Seller’s Dashboard and click “Edit Seller Details” button. How do I set an item's delivery options? When you list each item you can select your UK delivery options. The default setting is Standard Delivery 3 to 5 days but you can change this and/ or offer a Fast Delivery option. For Standard Delivery and Fast Delivery you need to enter a delivery cost in £ otherwise the cost will display as zero. If you deselect Standard Delivery and do not select Fast Delivery your listed item Delivery options will display as, "Please contact stall to agree delivery options". For international delivery please read FAQ "Are there any restrictions on selling Internationally"
Highlight 5 items – highlight 5 items on your Online Stall to be featured in relevant search results by promoting them above any non-highlighted items, and showcase them on the Vintassion home page rolling preview. You have the flexibility to select/ change/ replace any of your highlighted 5 items at any time e.g. when you sell a highlighted item. Each of your highlighted items will be shown randomly on the home page rolling showcase and in the relevant search results with other sellers’ highlighted items. Plus we will plug your highlighted items weekly across our popular social pages to 10,000+ genuine followers. Banner – promote your Online Stall with your own banner that will be displayed in the right hand banner column of the web pages customers view when browsing for items and stalls, including the home page. When your banner is clicked-on it opens your Online Stall. You can easily upload and change your banner at any time. The display of your banner and position in the column will be rotated randomly with other sellers’ banners. Expanded Seller Profile – promote your listings with an expanded entry in the A-Z of Stall Holders' directory by including a 50 word Seller Profile of your Unique Selling Points (USP) and a logo/ image, and when your entry is clicked-on it opens your Online Stall with your 50 word USP and logo/ image in front of all your listed items. You can easily upload and change your 50 word USP entry and logo/ image at any time. The standard Seller Profile directory entry is your seller’s name, town and county location (or country if an overseas based Seller), customer reviews, my fairs, payment options, policies, number of sold items, and number of recently sold items; all of which are also included in the Expanded Seller Profile directory entry. Plus we will also use your Expanded Seller Profile and logo to further help introduce, promote and feature your Vintassion Stall from time to time in the weekly Vintassion Uncovered Newsletter and across our social pages to 10,000+ genuine followers. 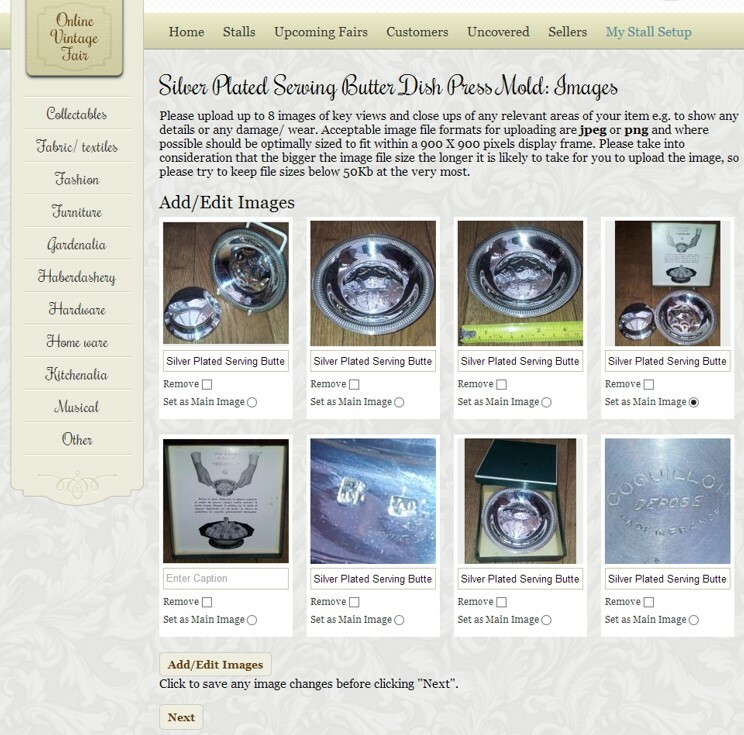 Seller's web links - further promote and sell your own vintage, retro, upcycled & handcrafted including up to 3 web links in the top part of your Online Stall to other sites or pages where you promote and sell your items e.g. ASOS, Etsy, eBay, Depop, Facebook or your own website. Your web links will be introduced as follows: “Please also visit our other web pages:”. When a web link is clicked-on it opens as another web page in the browser. You have the flexibility to easily add, change and delete your web links at any time. Plus we will include your web links alongside your Expanded Seller Profile when we feature your Vintassion Stall from time to time in the weekly Vintassion Uncovered Newsletter and across our social pages to 10,000+ genuine followers. Each promotion costs only £1 each for 30 days or £5 each for 365 days. Unfortunately it is not possible to select a supporting promotion midway during a selling period. For more details about how they work please click here. There are no limits on the number or value of the items you can sell during a selling period and you can keep listed for sale up to 100 items at any one time. Usefully you may also pre-list items and stock-up, so you can simply click to list new items as and when you sell. No, it is very much a seller’s own choice as to which international Countries they chose to sell and ship items i.e. there are no restrictions imposed by Vintassion. Sellers can say if they don’t or do offer shipping to particular international countries (e.g. the European Union) in their “Seller Policies”, which can be clicked on by customers when viewing their items (see Seller Policies FAQ). Please note the website can be visited from Europe and the Rest of the World, except any Countries that may choose to impose restrictions on sites their people can access. We would welcome your suggestions on new vintage top and sub-level categories that better match the genre of your stock and help customers better find items of interest. Please offer suggestions using the general enquiries & feedback contact form or the registered sellers' contact Vintassion button. Is it possible to temporarily hide listings e.g. when selling at a vintage fair? Browsing and looking at a your items on Vintassion can only help to increase footfall to the your stall at the fairs you are able attend e.g. your customers may contact you via Vintassion to request more information about your items for sale in advance of a fair. When a customer buys an item from your stall simply click the “Request Review” button for the sold item in your Manage Listings table, then enter the customer’s email, and click send. The customer is then invited to click on a link in an email to enter their review rating (poor 1 to 5 excellent) based on how well the item as described meets their expectations and the experience of buying from you. The customer may also add key comments. The review rating is then approved or rejected by Vintassion Admin. Your overall customer star ratings is displayed on your listed items and maybe clicked on to show all your individual review ratings. If you have a query over a customer review rating please use the contact Vintassion button in "My Stall Setup – Dashboard". How do I manage my seller’s account? 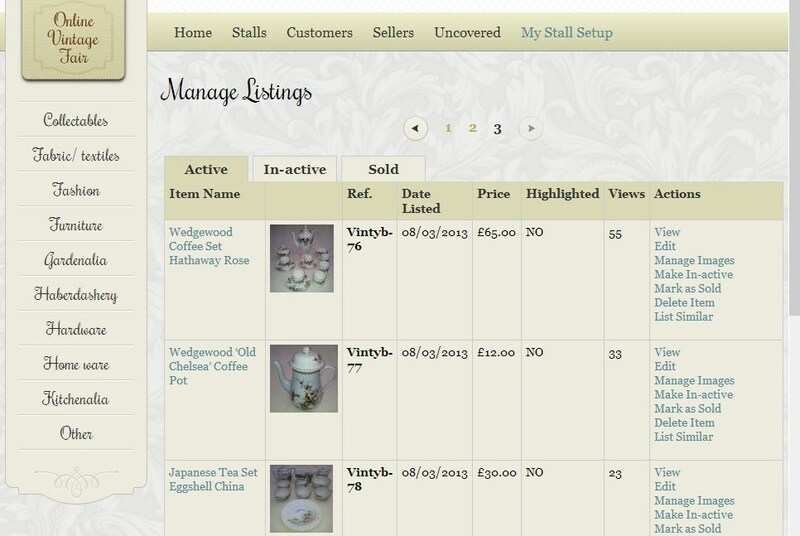 if you wish your item to go immediately live for sale on your Stall just click “Publish Item”.